TV shows like CSI or Law and Order are often criticized for their depictions of technologies that are not in wide use by law enforcement or the judicial system or are just plain made up. However, just like any sector, technological advancements are having a major effect on the US justice system and how cases are assembled and tried in court. In this article, we will be looking at some of those technologies and the impact they are having in the courtroom. The traditional suite of technologies associated with evidence collection is something most people are fairly familiar with, partly because of the newly found popularity of the the true-crime genre and party because of the exposure on popular tv shows. DNA testing, fingerprint analysis, luminol tests for blood evidence, surveillance footage, cell tower data, and even polygraph-based tests are still in common use and, much like all commonly used technologies, they have advanced over the years that they have been in use. Recent advancements in biometric and surveillance technologies, however, have opened up a whole new range of options when it comes to identifying suspects. Facial and iris recognition tech, now commonly included with most high-end smartphones can use used alongside traditional fingerprint data to link a person to a place or crime scene. Surveillance systems, especially those used by the US government are increasingly incorporating facial recognition technologies, and while the tech does still have some issues to iron out, it does show promise for active tracking suspect’s movements. Polygraph-based tests, also known as lie detector tests are still used in criminal cases, but their veracity is often called into question and they aren’t considered to be the definitive proof that a person is lying that they once were. A possible replacement for polygraph tests are brain imaging techniques that make use of functional magnetic resonance imaging (FMRI) to scan an suspect’s brain and detect minute changes in blood flow that indicate which areas of the brain are active. While the technology is still in its infancy, research has indicated that this promising technique for determining a suspect’s guilt can detect when a person is lying with 70% to 90% accuracy. When presenting evidence in the courtroom lawyers have been using the same techniques for decades, such as writing information on a whiteboard or easel, handing printed documents or photographs directly to the jurors, reading original testimony straight from a transcript, and presenting important documents or images by mounting them on presentation board. While these techniques have, and continues to be, useful, they are looking increasingly outdated in the face of technologies that have become common outside of the justice system. New lawyers and, just as importantly, new jurors come to form a generation accustomed to advanced media technologies being part of their day to day lives. Many of today’s younger jurors find the presentation of evidence more effective when more modern technologies are used. With this being the case, there is an increasing movement in the US justice system to upgrade courtroom to the so-called “e-courtroom”. Designing the courtroom of tomorrow that makes use of interactive flat-screen displays, webcasted testimony, use of dual screens that present several documents to the jury at once and even personal screens for each juror in the jury box. 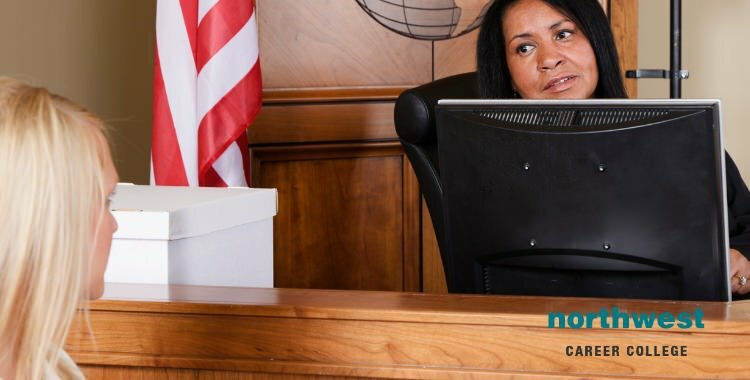 Reacharch by a Superior Court judge, tasked with uncovering evidence that there was a need for courtrooms to upgrade their tech, revealed that, in a survey conducted on jurors over several months of a complex criminal trial, 72% to 100% of jurors reacted positively to the incorporation of modern forms of technology. The only caveat being that they juror had to know how the technology worked in the first place. Join Our Criminal Justice School Today! Qualifying from our Criminal Justice School puts you in an excellent position to access a variety of employment opportunities as you look for one that suits your skills and interests. At Northwest Career College, our Criminal Justice instructors include licensed, practicing attorneys and degree instructors able to teach, not only the law but also to guide our students in the many ways a criminal justice graduate integrates into a Las Vegas legal profession. As part of our Criminal Justice Program, you’ll visit courts, jails, meditation centers and more to experience first-hand the law in action which will make your criminal justice training applicable to the Las Vegas legal system. Northwest offers a flexible blended program with all criminal justice classes Las Vegas law classes taught on campus by an attorney and general education courses offered online. Our experienced instructors are on-campus to review and support your learning experience at all times. Call us at (702) 403-1592 to speak to one of our enrollment team about joining our Criminal Justice Program today! Previous Blog: Writing Your Own Mock ExamNext Blog: Can You Be a Freelance Paralegal?